NASA has teamed up with Apple on a short film, “Visions of Harmony,” celebrating the imminent arrival of its Juno probe at Jupiter this Monday, July 4. It’s available for free on iTunes and Apple Music, and features music by former Nine Inch Nails frontman and current Apple Music executive Trent Reznor, as well as Weezer, GZA the Genius, and Zoe. When NASA’s Juno spacecraft—a 400 pound box of reinforced titanium strapped to a 66 foot-long solar panel—arrives in orbit around Jupiter on July 4th, humans will be able to peer beneath the monstrous gas giant’s upper atmosphere for the first time, into the layers of poisonous thunder clouds packed below. Over the course of a year, Juno will map the entire surface of Jupiter, all the while using nine scientific instruments to probe the gas giant’s interior composition and powerful magnetic field. 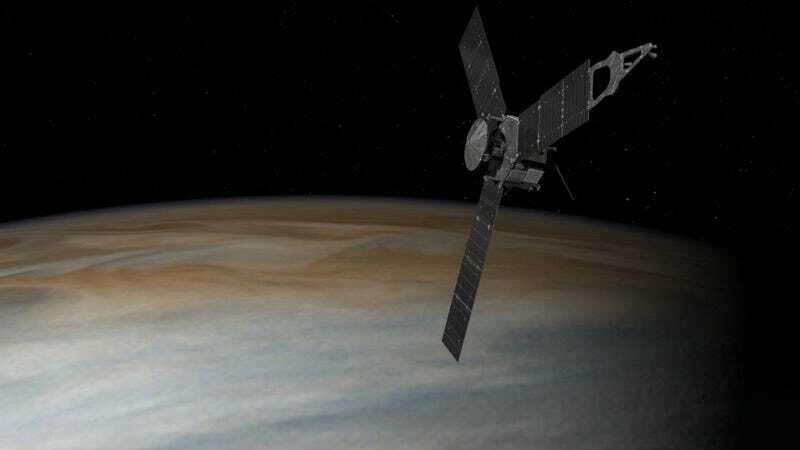 “Nobody’s ever seen Jupiter the way we will,” Juno mission director Scott Bolton told Gizmodo. The film opens with Scott Bolton, Juno’s principal investigator, reminiscing about the first time he saw the night sky unhampered by light pollution, and found himself overcome with wonder and awe. It’s a sentiment shared by musician Corinne Bailey Rae, among others, epitomizing the deep connection between science and music that is the central thesis of the film. The background music, by Reznor and Atticus Ross, was inspired by the sounds emitted by Jupiter, recorded by NASA instruments. “Juno,” Trent Reznor and Atticus Ross. “I Love the USA,” Weezer. “The Skies Will Break (Juno Mix),” Corinne Bailey Rae. “The Spark,” GZA the Genius. “Everything (the Universe),” feat. Jim James. Conspicuously absent: Train’s “Drops of Jupiter.” Ah well, maybe there will be sequel.